I want to know why they don’t allow cats in the military. I have some daring moves. I can move quicker than a dog. I can put any military dog down. I’m slicker than a rat on ice. I can pick a flea off a (MWD) dog. And he won’t even feel it. Come on, I can teach feline basic training. The cost of our uniforms would be cheaper. You won’t hear my heavy paws. I’m a cat that wants to serve our Country. 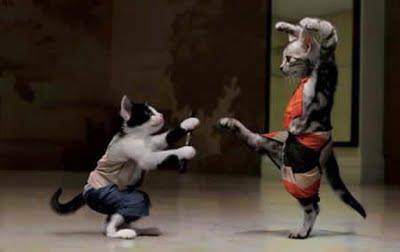 I know Cat Kung Fu. Come on, you know Obama doesn’t want to spend any money on uniforms. Vote for Republican Donald Trump and strengthen our American Military! Reblogged this on I Heart America.